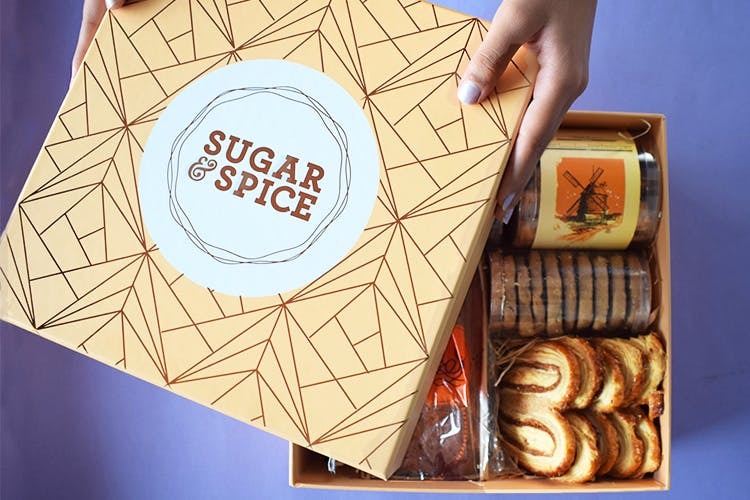 Sugar & Spice, one of our go-to bakeries in town, is offering a hamper box that's got an assortment of bakery and confectionery items any foodie will love. Gifting, baked goods, handmade confectionery. Sugar & Spice is a bakery we go to time and again when the sweet tooth starts acting up. Their cupcakes, breads, and gluten-free cookies are just some of our favourite things. Since they've got a wide and varied menu, they've come out with a hamper box that's got some of their best baked goodies and confectionery items. You'll get stuff like Bistick almond, Bistick cashewnut, garlic toast, cheese straw, blueberry dry cake, a packet of lavash and French hearts in the box–don't forget to get your Insta face on as you open it. We wish there was an option to customise the box to our preferences. This would make for a great gift for your foodie friends and an awesome tea-time snack source.